Demand within the DVD market is often inconsistent. On average, over half of the 40 million DVD’s that Katoen Natie distributes in France will be picked in the months of October and November. This fluctuation can also happen on a weekly or even daily basis: “When it rains during school holidays, there will be a significant increase of sales in DVD’s”, says Hans Vansweevelt. One of the key factors in selecting Pick to Light was due to fluctuating demand within the Belgian market, making labour planning and accurate scheduling difficult. “Retailers such as Carrefour and Fnac can place an order as late as 13:00 for next day delivery. This happens regularly, so we need to utilise extra temporary labour when the order comes in bigger than expected. We can’t afford to train all these temporary employees to work with barcode scan-ning or voice recognition, but with pick-to-light they are operational in less than an hour”, explains Vansweevelt. 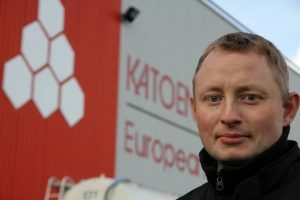 Katoen Natie has been using Pcdata’s Pick to Light systems since spring 2008 when the Farébersviller operation first began DVD distribution for a well-known film studio. In the summer of 2010, they secured the distribution contract for a second studio and installed another Pcdata system in a nearby warehouse to cope with the increased demand. This now means that one in three of all DVDs in France are distributed from Farébersviller, in the North East of the country nestled by the German border. The two Pick to Light systems in the Farébersviller sites operate using the same basic principles. A long roller conveyor carries empty crates or boxes along the pick-face with hundreds of shelved pick locations divided into multiple zones. On entering a zone, the system identifies what products are required for that box and the corresponding displays are illuminated and show the required pick quantity on the LED display. The operative simply picks the correct quantity to the box and turns out the light by pressing the button on the face of the display. As an additional check, each picking zone is equipped with a zone display that counts down the number of picks as the lights go out and shows the picker the barcode number of the box they are picking to. 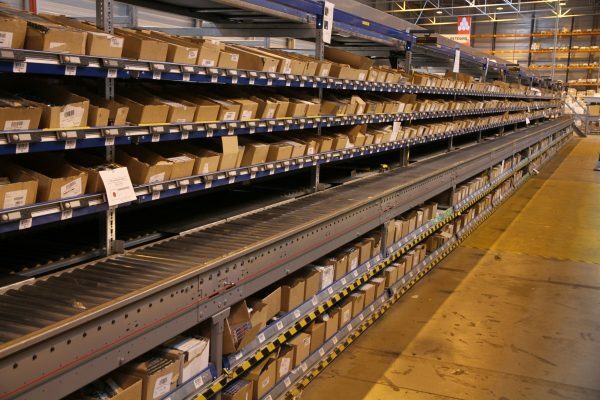 At the larger of the two systems in the Farébersviller operation, the conveyors that transport the empty boxes have driven rollers, meaning boxes can be moved effortlessly around the system. Through the use of automatic scanning at each zone entrance, the Pcdata system can direct each box to any one of 20 zones. This means that each box only ever need visit a zone where it has demand, increasing the capacity and speed of the system significantly. The smaller system, however, utilizes a gravity roller method meaning ship-ping boxes are manually pushed around the system by operatives. 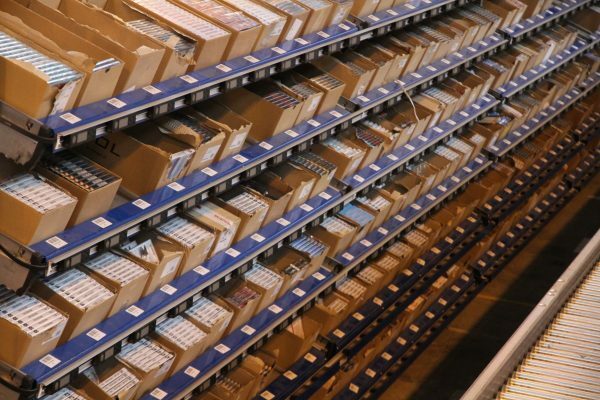 This method does mean that each shipping box must pass every zone and pick location, but in a small operation with lower through put, this alternative offers a great cost effective solution to a fully automated driven system; “With the small system the demand is much lower and we pick on average 8.000 DVD’s per day. In main system the number is more than four times that”, says Vansweevelt. 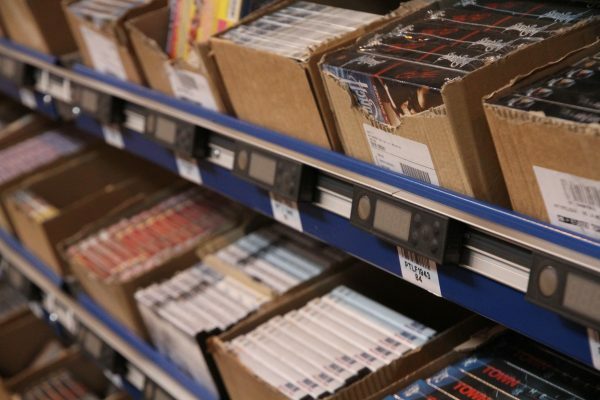 Both the systems at Farébersviller are used for daily store replenishment with a range of DVD’s that never shrinks “It is a key characteristic of this sector is that new titles are being added continuously but are rarely delisted. At this point we have over 6000 titles in stock and this number is constantly growing”, said Vansweevelt. 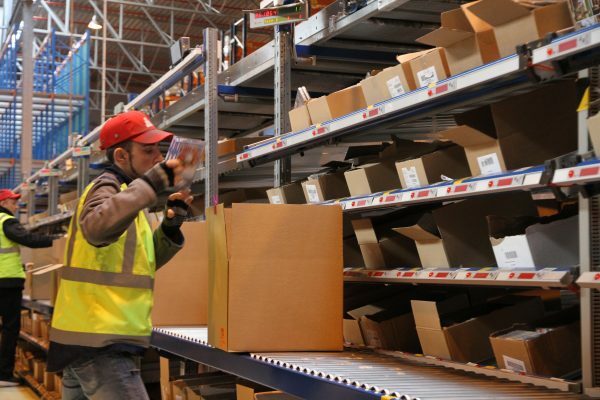 To maintain an efficient pick operation, Katoen Natie constantly analyse the number of titles they stock to assess the order pattern and frequency of each. Commonly, when a new title hits the market, it starts life as a fast moving line, but over time demand declines and the title becomes a slow mover. Keeping fast an slow moving lines apart within the picking operation greatly improves throughout and productivity within the entire operation. 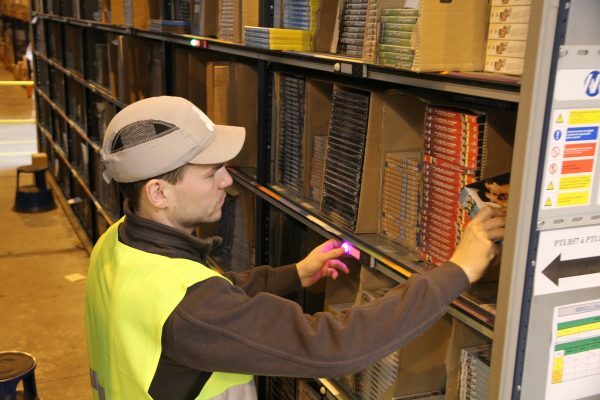 Fast moving lines are picked using conventional Pick to Light and the DVD’s are stored in flow racks to enhance replenishment speed. Slow moving lines, however are handled with a variation of Pick to Light: Pick to Colour. In the slow moving ‘Library’ normal shelving is used to store DVD’s and these shelves are installed perpendicular to the conveyor rather than parallel to it, maximizing floor utilisation. Every six shelf locations are allocated a colour and a Pcdata pick display. When there is demand for a product in one of these six colour coded locations, the pick display buttons lights up with the corresponding colour to direct the operative to the correct location. “With this method we have reduced costs and the numbers of displays required. At the same time the productivity in this area is far higher than within our barcode scanning area. For fast movers this way of working is much less effective, because the pick intensity is considerably higher. For this reason, we continue to use one display per location within our fast moving areas”.